The Anker performed best in our tests, has an attractive shape and material that fits nicely in the hand, and features a perfectly adequate three ports, including a combined in/out USB-C charging port. Even when charging or discharging at its maximum rate, it remains cool to the touch due to its aluminum casing. If you need a high-capacity battery that can fully charge a 12-inch MacBook, this is your best bet. At about $50, that’s far cheaper (especially adjusted for inflation) than what a removable replacement used to cost when Mac laptops offered swappable batteries. 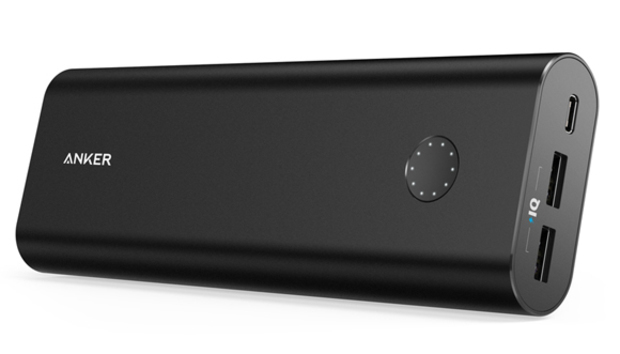 Besides the USB-C port, which provides 3A output, it has two Type-A ports which can each pump up to 2.4A, although the battery maxes out at 6A. With three devices plugged in, no one port will get more than 2.4A. Its ports have minimal markings, unlike most packs, because the Type-A ports are identical. In testing with a MacBook, the Anker had the best outcome. Its 20,100 mAh of internal cells managed to charge a MacBook from fully drained to a 100 percent indicator using about 90 percent of its stored power. You could still charge an empty iPhone to full or an iPad about 20 to 30 percent with that remaining charge. When fully charged, it should be able to charge an iPad Air 2 at least twice, or an iPad Pro about 1.5 times. You’d think LEDs would be a by-the-way feature, but Anker made extremely fine decisions with its design, both in terms of the Apple-like elegance of tiny blue pinpricks of lights, to the inclusion of ten of them. This provides the most granular battery status among units tested and my general experience with USB packs, showing 10 percent increments. It uses a slow cycling animation while the battery charges, leaving LEDs lit to indicate the current filled percentage. The only drawback with this model is that when you’re using it to charge via its USB-C port, you have to press its battery-status button to start the process. It’s documented in a tiny included manual, the type size of which requires a magnifying glass, but it’s non-obvious. Pack includes mesh carrying bag with drawstring, USB-C to Type-A cable, USB-C to Micro-USB cable. 18-month warranty.